Educational tools which introduce children to the letters of the alphabet and the basics of reading have been used for hundreds of years. Hornbooks, recognised as the earliest means of teaching the alphabet, were in use from the 16th to the 18th century. They were made of a flat piece of wood with a handle, and a printed sheet showing the alphabet was attached to the wood and covered with a protective layer of horn. The mid-18th century saw the introduction of the battledore, a small, folded card which showed the letters of the alphabet and was often illustrated with woodcuts. Some battledores also featured a syllabary (a table or list of syllables) or a short rhyme. In the early 19th century, alphabet books as we recognise them today began to be published more frequently. These generally took the form of short primers showing the alphabet, syllables and simple words, together with a Bible text or story with a moral message. With the development of colour printing technology in the later 19th century, alphabet books became more common, and the illustrations more detailed. Pictures were generally familiar objects from daily life and moral themes were much less prevalent. This era also marked the beginning of the trend which continues today, whereby the primary purpose of many alphabet books is not to teach the alphabet as such, but rather to amuse the reader who already knows their alphabet by combining the letters with illustrations and an accompanying text that may be single words, rhymes, or a story. The first publication of a newly discovered nonsense alphabet manuscript by Edward Lear, in which the drawings and verses differ markedly from those in other Lear alphabets. 1981 Originally published: An alphabet of old friends. London : George Routledge and Sons, 1874. The absurd ABC. London : John Lane, Bodley Head, between 1895-98. Books: These alphabet books from the Dorothy Neal White Collection and National Children’s Collection are on display outside the Turnbull Library Reading Rooms on Level 1 of the National Library building. (Use the Molesworth Street entrance) ..more..
We are sorry to hear of the death of Derek Gordon, the storyteller Bringwonder, who entertained the Friends in August 2013 with his Celtic tales. Philippa Werry is a children’s writer whose non-fiction, stories, plays and poems have been widely published. Several of her books (including Enemy at the gate, Anzac Day and The New Zealand wars) have been shortlisted for awards. Philippa lives in Wellington; she maintains several blogs and participates in the Writers in Schools programme. Philippa will describe her current writing project, based on her visit to Antarctica in 2016 with Antarctica NZ’s community engagement programme (formerly Artists and Writers to Antarctica). She will be talking about some of the Antarctic children’s literature that she came across during her research, as well as the unexpected links and connections she found to her previous books about war. We as the Friends of the Dorothy Neal White society, are hosting the Australasian Children’s Literature Association for Research on Saturday 14 July 2018. This is part of the ACLAR Biennial Conference 2018 which is being held at Victoria University. We warmly welcome the members of the Friends (DNW) to join us at this event. Chris Szekely, the ATL Chief Librarian will be introducing the event and welcoming people to the Alexander Turnbull Library. Mary will be preparing some choice samples of the DNW collection and there will be drinks and nibbles hosted by the FDNW. You are invited to the Annual General Meeting 2018 of the Society of the Friends of the Dorothy Neal White Collection which will be held on Tuesday 19 June. The AGM will be held in the Programme Rooms, Ground Floor, National Library of New Zealand, Wellington, at 5.30pm for drinks and nibbles, 6:00pm talk, 6:30 AGM. If you have items for the AGM agenda please reply, or post to PO Box 12-499, Thorndon, Wellington 6144. 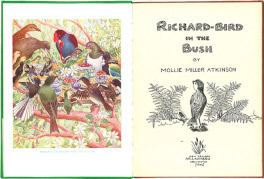 Before the meeting the Research Librarian, Children’s Literature, at the Alexander Turnbull Library, Mary Skarott, will show some of the publications recently donated to the collection. Attached is a flyer for the AGM that we would appreciate your displaying or distributing if you have the opportunity. We welcome members and non-members. A gold coin donation from non-members is appreciated. We are pleased to say that all of our current committee members are happy to stay on. Committee members are responsible for helping to plan future events, taking minutes (a shared responsibility), promoting the DNW collection, being involved in the selection process for FDNW research scholars, contributing to the newsletter, and lending a hand with catering and set-up at our events. The usual commitment is about 8 meetings/events a year. This includes the AGM. If you would be interested in joining the committee, in any capacity, or would like to nominate someone (with their knowledge of course), please reply to friendsdnw@gmail.com or phone Corrina on 04 382 3548. Ever since the ‘School journal’ began in 1907, poetry has been an integral part of its content. Individual issues regularly included at least one poem and, in the early years, a poem was often placed on the front cover. Occasional “verse” issues, devoted solely to poetry, have also been produced. Poems by New Zealand writers have always featured in the ‘Journal’, but overseas poetry was dominant until the 1950s. From then on, New Zealand poets such as Denis Glover, Basil Dowling, Eileen Duggan and James K. Baxter appeared frequently. Poetry by Margaret Mahy first appeared in 1961, the beginning of a trend to include more works by poets who specialised in writing for children. Poems written by New Zealand school children have also been included in the ‘Journal’. “Children’s numbers” published in the years following World War II included stories, artwork and poems by children and, in later years, children’s poems have sometimes appeared alongside regular content. These items from the Dorothy Neal White Collection and the National Library’s general lending collection will be on display in the 1st floor foyer of the National Library until the end of March. ￼Mahy, Margaret. “Alone in the house”. School journal, part 1, number 3, 1965 (Wellington: Ministry of Education) — at National Library of New Zealand. Cowie, Wilson. “Rising tides”. School journal, part 2, number 2, 2007 (Wellington: Ministry of Education)..
Ursula K. Le Guin dies age 88. She wrote science fiction, women’s affairs and young adult fiction amongst others things. She gained fame in 1969 with The Left Hand of Darkness, which involves a radical investigation of gender roles. The Earthsea books have sold in the millions in 16 languages. In December, she published a collection of essays based on blog posts called No Time to Spare. Ms Joy Cowley has been one of New Zealand’s most prolific and successful writers since the 1960s and has made a strong contribution to both literature and literacy. Ms Cowley began her career writing novels for adults and published several such novels during the 1970s, following her debut book ‘Nest in a Falling Tree’ (1967). She is best known for her children’s fiction, which includes the books ‘The Silent One’ (1981), ‘Bow Down Shadrach’ (1991) and its sequel ‘Gladly, Here I Come’ (1994). She has written 41 children’s picture books and has emphasised the need for children to see themselves in the books they read, particularly in their early years. She has been heavily involved in teaching early reading skills and helping those with reading difficulties. In this capacity she has written more than 1,000 reading books to assist in teaching reading and associated skills to schoolchildren. Her books are renowned internationally and are used in more than 70 percent of American schools. She is a patron and former Trustee of the Storylines Children’s Literature Charitable Trust, which supports and promotes the development of children’s and young adults’ literature in New Zealand. She has been widely recognised with numerous national and international literary awards throughout her career, including the Prime Minister’s Award for Literary Achievement in fiction in 2010 and the University of Alabama’s Maryann Manning Award for Outstanding Literacy Scholar in 2011. Since being appointed a Distinguished Companion of the New Zealand Order of Merit in 2005 she has continued to write for publication, the most recent book being ‘Helper and Helper’ in 2017. As Honorary President of the New Zealand Society of Authors Ms Cowley delivered the 2011 Janet Frame Lecture. A great event at the National Library next week, as we join hands with the New Zealand Festival’s Writers & Readers Week. On Saturday morning 10 March 2018 between 10.30-1.30, its Lots in Translation, a morning of picture book readings by guest authors and members of Wellington’s diverse multicultural community. And a celebration of the growing wealth of children’s picture books in te reo Māori, Samoan, French, German, Swedish and Japanese with Gecko Press, Huia Publishers and The Sapling. of the 2017 Storylines Betty Gilderdale award for outstanding service to children’s literature. Whitcombe and Tombs was the dominant publisher in the New Zealand educational market in the late 19th and early 20th century. Estimated sales of their very popular ‘Whitcombe’s story books’ series, published between 1908 and 1962, were in excess of 12 million copies. Edith Howes wrote fifteen ‘Whitcombes story books’ in all, issued in numerous printings between 1921 and 1957. ‘Where bell-birds chime’ was part of the Dainty booklet series. Howes’ publications, from the Dorothy Neal White Collection, will be on display outside the Turnbull Library reading rooms through the end of November. — at National Library of New Zealand. Whitcombe and Tombs was the dominant publisher in the New Zealand educational market in the late 19th and early 20th century. Twins Win and Twin are siblings to a new baby and want to know where it came from. A collection of short stories about plants, animals and fairies through the seasons. Tup looked about. There certainly were anemones everywhere, brown anemones, little gold-and-silver anemones, anemones with blood-red centres and deceiving rims of broken shells and tiny stones, anemones of purple striped with green, of yellow striped with orange; higher up the rocks were dark red blobs that, when the tide came in, would open out into scarlet blossoms like cactus dahlias. And there was this great rose-and-lilac beauty before them, with her greedy arms. Tup looked at her again and realised how near he had been to a struggle for his life. When completing research for this story, Edith spent months observing the plants and creatures of beaches and rock pools around Wellington and Stewart Island. Howes, Edith. The singing fish. With illustrations by Florence Mary Anderson. 1921 (1922 reprint) — at National Library of New Zealand. Twins Win and Twin are siblings to a new baby and want to know where it came from. They do not believe their grandmother’s tale that it was found under the gooseberry bush. Their parents are more forthcoming and turn a cradle into a ship, and the family sails to babyland to find the answer. Somewhat sentimental and naïve in style when read today, The cradle ship was nonetheless a groundbreaking attempt to introduce children to the facts of life. It was reprinted 18 times and translated into French, Italian and Danish. Howes, Edith. ‘The cradle ship’. With illustrations by Florence Mary Anderson. 1916 — at National Library of New Zealand. A collection of short stories about plants, animals and fairies through the seasons. This was Edith’s first book, and was so well received that it led to her being made an honorary member of the New Zealand Institute (which later became the Royal Society). Howes, Edith. ‘The sun’s babies’. With illustrations by Frank Watkins. 1910 — at National Library of New Zealand. Children’s activities available to them in today’s digital age are quite different from those of 100 years ago. This selection of books from the Dorothy Neal White Collection explores the pastimes and activities that were considered suitable for children with time on their hands in a world with no radio, television or internet. These included doing something useful (domestic skills, making things, gardening, playing an instrument), getting out in the healthy fresh air (outdoor games, nature study, camp cooking and survival skills) and entertaining friends and family at home with such diversions as parlour games, magic tricks, puppet shows and scientific experiments. Many of the suggested activities are, of course, still popular alternatives to poring over a digital device, but not many children nowadays will spend hours making matchbox furniture or perfecting their ventriloquism skills. A selection of titles from the Dorothy Neal White Collection is on display for the next few months just outside the Turnbull Library reading rooms. — at National Library of New Zealand. ‘The girl’s own indoor book: containing practical help to girls on all matters relating to their material comfort and moral well-being’. Edited by Charles Peters. (London : Religious Tract Society) 1888? Nicola is a senior lecturer at the University of Waikato where she teaches children’s literature at undergraduate and postgraduate level. She is a past recipient of the Dorothy Neal White Fellowship and the Marantz Picturebook Collection Fellowship at Kent State University. In this presentation over 200 English-Spanish dual language picturebooks, from the Marantz Picturebook Collection for the Study of Picturebook Art, are analysed in terms of the relative status of the two languages and how this is communicated via relative print size and placement. The separation between languages in the picturebooks analysed is discussed in relation to bilingualism and translanguaging. Noted scholar and writer, Dr. Mere Whaanga, currently the Children’s Writer in Residence at the University of Otago, is giving a research seminar, sponsored by the Centre for Research on Colonial Culture, on Friday 28 July 2017. Her talk is titled: “From pepeha to picture book to tribal history: telling Māori stories in multiple genres”, and it will take place at the Hocken Library Seminar room, 90 Anzac Avenue, starting at 3.30. With great sadness we advise the death of our Patron Barbara Murison. The article was published in the New Review of Children’s Literature and Librarianship and is titled: Pākehā-Māori: European-Native. Ethnic Labeling in the Dorothy Neal White Collection. Nicola has said she will be able to address the Friends about her visit to the Marantz Collection. This should be near August/September. More details soon. Gold coin donation from non-members appreciated. Minutes for year ending 2016 here. Mary Hutton was instrumental in the creation of the Dorothy Neal White Collection and of this Society, The Friends of the Dorothy Neal White Collection. She was life-long advocate for children’s literature and active in the wider community as a driver for Meals on Wheels and weekly volunteer at the Mary Potter Hospice for many years. When she died suddenly but peacefully in August she was still regularly guiding visitors to the Wellington Botanic Gardens. While most members of the Friends are likely to be aware of her role with this Society, many are unaware of her long and influential career as Co-ordinator of Book Selection for School Library Service. Mary began in this role in 1950 and retired from it in 1990. As well as co-ordinating and managing the budget for all genre, including non-fiction and adult titles of interest to teenagers, Mary selected all the children’s fiction for School Library Service. This includes the National Children’s Collection (NCC), which was initially the repository of headquarters review copies and is now a research collection supported by this Society. Several of Mary’s colleagues have gathered together their reminiscences of Mary’s career. Also see our current newsletter. On Wednesday 7 December 2016 we enjoyed our End of Year Event followed by Chris Szekely who discussed his latest book, Rona, a chapter book for 7-9 year-olds, published by Huia Publishers – and getting excellent reviews. Tala Tusi: The Teller is the Tale in 4 Tales. Delivered by Selina Tusitala Marsh. followed by our special guest, Chris Szekely, who will discuss his latest book, Rona, a chapter book for 7-9 year-olds, published by Huia Publishers – and getting excellent reviews! Due to the recent earthquake we have had a slight change of venue for our Christmas event on Wednesday December 7th. It will now be held on the Ground floor of the National Library in the programme rooms to the right of the foyer as you come in the front doors (Molesworth Street entrance). All other details remain the same. We look forward to seeing you. Members might remember that we included an obituary for Terry Pratchett in our June 2016 newsletter so we are particularly delighted to have Geoff come and share some of his insights into the writing of this fascinating author. Dr Geoff Miles is a Senior Lecturer at the School of English, Film, Theatre and Media Studies at Victoria University of Wellington. His current research focuses on the classical tradition in English literature and in particular on the uses of classical mythology. He the co-author (with Paul Millar and John Davidson) of ‘The snake-haired muse: James K Baxter and classical myth’ (VUP, 2011) and the editor of ‘Classical mythology in English literature: a critical anthology’ (Routledge, 1999). We hope to see you at the National Library on Tuesday 27 September 2016 starting at 5:30pm with drinks and nibbles. Read the flyer about the event. If you have a place to put this on display that would be appreciated. As many of you will know one of our founding members Mary Hutton died on 5 August 2016. At the September meeting, our first meeting since her death, Lynne Jackett will pay tribute to an influential colleague and friend. The Wellington Children’s Book Association is hosting a presentation by Margaret Mahy Award winner Barbara Else on Monday 19 September 2016. Barbara was named the 2016 winner of New Zealand’s top award for children’s writers and illustrators in March. The Storylines Margaret Mahy Medal is awarded annually for lifetime achievement and an outstanding contribution to New Zealand children’s literature. As part of the award Barbara was invited to present a public lecture in Auckland in April. John and Ruth McIntyre have organised for Barbara to give her talk in Wellington at The Children’s Bookshop in Kilbirnie. Finger food and drinks provided. Meet from 6.30pm for a 7pm start. This is an open invitation – no charge but please RSVP to books@thechildrensbookshop.co.nz for catering numbers. Barbara and Chris have recently moved to Dunedin so this will be a chance to catch up with Barbara on her flying visit back. Nicola is is off to spend time in the Marantz Picturebook Collection at Kent State University, in Ohio, USA. She’ll be there for two weeks collecting data about dual language picture books. Mary Hutton talks to Peter Ireland after the 2007 Annual General Meeting of the Friends. Mary Hutton was a founding member, long-time committee member and inspiration for the establishment and continuation of the Dorothy Neal White Collection. I have been involved with the Dorothy Neal White Collection since its inception. When School Library Service was based on Thorndon Quay organising librarians gathered up pre-1940 books from schools where they were not in use. This nucleus of the Collection was supplemented by the addition of a consignment of withdrawn books from the Dunedin Public Library, many of them selected by Dorothy Neal White. When the School Library Service, under Director Phyllis MacDonald, was relocated to Tawa a room was set aside for the collection of pre-1940 children’s books to be enlarged and developed. The Society of Friends was set up and I became their President from 1984 – 2000. Since then I have remained a committee member. Most of my working life has been spent in the employment of the National Library, first in the acquisitions and reference sections of adult services, but predominantly in the Head Office of School Library Service where I worked as Co-ordinator of Book Selection, selecting and reviewing children’s and young adult books from around the world – work I thoroughly enjoyed. I was fortunate to be able to attend some overseas conferences about children’s books and reading, in Canada, Japan and Australia, meeting authors and other librarians in the field. Since I retired in 2000 I have kept busy with voluntary work, walking, gardening, catching up on adult books and assessing an occasional manuscript for a local publisher. This has enabled me to keep my hand in with information about trends in children’s books and reading. While I regret the relocation of the Dorothy Neal White Collection from its prime position on the top floor of the National Library, it is good to know that it is again accessible on the lower ground floor with a competent and enthusiastic children’s literature research librarian in charge of its promotion and development. Beatrix Potter was born in London into a well-to-do family on 28 July, 1866. She was the elder of two children, her brother, Bertram, being six years her junior. She was educated at home by a governess, and opportunities to spend time with children other than her brother were very limited. From an early age Beatrix showed considerable artistic talent. As a child she spent a lot of time drawing and painting, often making studies of the many animals that she and her brother kept as pets in their nursery. Among her favourite subjects were her rabbits, Peter and Benjamin Bouncer, and a selection of mice. She also developed a keen interest in plants and botanical illustration. Family holidays in the country, in particular the Lake District, provided further inspiration.A fiercely independent young woman who was keen to have an income of her own, she began to sell her drawings as illustrations for books and greetings cards. Then came the idea for a book, which was eventually accepted for publication by Frederick Warne & Co. ‘The tale of Peter Rabbit’ was published in 1902, the first in a series of 23 tales inspired by her love of animals and the countryside. Her last children’s book was ‘Little Pig Robinson’, published in 1930.A final, previously unpublished tale, ‘Kitty-in-Boots’, is due to be published later this year with illustrations by Quentin Blake.The books featured here come from the Dorothy Neal White Collection and the National Children’s Collection. IBBY (International Board on Books for Young People) Biennial Congress was held in Auckland in August 2016. IBBY is an amazing organisation with sections in more than 70 countries, many of whom will send representatives to New Zealand for the congress. Tuesday Dec 8th 5.30 for a 6pm start. Committee members read a favourite extract or book around the Christmas theme. The Friends recently published Notes-Books-Authors 12. The nineteen-forties: a turning point in writing for children by Trevor Mowbray is now available as a pdf on this site. Adventure stories for children became popular from the mid-nineteenth century and early examples, aimed at boys, often dealt with military and imperial subjects. However, after World War I and onward into the twentieth century, there developed a trend for smaller scale adventures, including both male and female characters, with an intended audience of boys and girls. Many of these stories fell int into the genre of ‘holiday adventure’, with Arthur Ransome and Enid Blyton being the most notable contributors. Parental absence was contrived by various means, leaving the children free for summer holidays filled with exploring, camping, sailing, detective work and the occasional mishap. Enid Blyton. Five go off in a caravan. Illustrated by Eileen Soper. Enid Blyton. Five on a treasure island. Illustrated by Eileen Soper. Arthur Ransome. Swallows and Amazons. Illustrated by the author with help from Miss Nancy Blackett. Esther Glen. Uncles three at Kamahi. Illustrated by Percy Graves. Philippa Francklyn. The mystery of the swamp. Janet S. Aldis. The campers. Miniature books first appeared in Europe during the Middle Ages. At that time they were usually prayer books, and their size allowed them to be easily carried and concealed. During the 19th and 20th centuries, books on all manner of subjects were made as miniatures, including fiction, dictionaries, bibles, prayers books and works like fishing guides that could easily be taken on an outing. Prized by collectors, a true miniature book is generally one that is less than about 7.5cm in width or length. The little children’s books on display here were commercially published in the late 19th and early 20th centuries, when publishers produced miniature libraries especially for children. While they are not all small enough to be true miniatures, they are perfect for small hands to hold. Marie de Bosguérard. Les amis de la maison ; Bons camarades ; Châteaux de sable ; Poussins petits. Betty Blue. Illustrated by Rosa C. Petherick. The tale of a dog. Illustrated by W. Foster. Facsimile. Originally published: London: Ernest Nister, 1890. Little and good ; A little love letter ; Merry legs: the story of a gee gee ; Quick march. The Society remembers librarian, Dorothy Neal White, who was born 100 years ago on 22 December 1915. She died in 1995. Children’s annuals were first published in the early nineteenth century and increased in popularity during the Victorian era. By the end of the nineteenth century most publishers produced an annual of some kind.Annuals were produced at the end of the year, with the Christmas market in mind. Some were made up of a specially compiled selection of material, and others were bound volumes of weekly or monthly magazines that had been issued during the year. Examples of both types are on display here.Their tone ranged from moral and religious to more adventurous and secular, and content included stories, poems, informative articles, letters from readers, puzzles and quizzes. These examples, all from the Dorothy Neal White Collection, are on display outside the Turnbull Library through to the end of November. The Ready to Read instructional reading series was introduced to New Zealand schools by the Department of Education in 1963. For the first time, New Zealand children were learning to read from materials that reflected their own Southern Hemisphere worlds. “where the sun shines from the north and Christmas Day is in summer, where the farm looms larger than the factory, whose flora and fauna are foreign to the European textbook writer …” (Clarence Beeby, 1957). Kay will share what she has discovered about the depiction of New Zealand within these fondly remembered Ready to Read materials. In addition to her slide presentation, Kay will bring along copies of the books. Browsing and reminiscing will be strongly encouraged. We are pleased to announce: Barbara Murison has accepted the role of Patron of the Friends. At the National Library, Wellington. Dr Tatjana Schaefer, English Programme, Victoria University of Wellington, will mark the 150th anniversary of the publication of Alice in Wonderland with a talk to the Friends at the National Library of New Zealand. Drinks and nibbles from 5.30pm. Talk at 6pm. The fable is one of the oldest literary forms with the earliest known examples dating back to around 3000 B.C. The fables attributed to Aesop, a Greek slave, date from around 500 B.C. On display here are some examples dating from the late 19th and early 20th centuries with pictures by some of the prominent illustrators of the day. Randolph Caldecott has chosen to include contemporary social comment in his work, while Walter Crane has rewritten each fable in the form of a five-line limerick surrounded by elaborate illustrations. Title pages by Charles Robinson and Arthur Rackham show typical Art-Nouveau elements. We are delighted that our Research Scholar, Nicola Daly, will give a presentation Pakeha-Māori: European-Native. Ethnic labelling in the Dorothy Neal White Collection before the AGM. See the Alexander Turnbul Library site for more details. Time: 5.30pm – 7.00pm, talk begins at 6.00. Location: Tiakiwai (lower ground floor), National Library, corner Moleworth and Aitken Streets. Contact Details: Email Mary.Skarott@dia.govt.nz for more information. Mary Skarott (Research Librarian, Children’s Literature) will talk about some of the recently published children’s books about World War I that have been added to the National Children’s Collection. A Friends of the Dorothy Neal White Collection event. On 22 August 2013 in the Tiakiwai Room of the National Library building, Bringwonder entertained with Celtic tales, mainly Scottish, to celebrate his family roots. Bringwonder is New Zealand’s first professional storyteller with over 30 years of experience, both here and overseas, drawing inspiration from a wide range of cultures and topics. Below: Chris Szekely discusses his books. We record with deep regret that children’s author and patron of the Friends of the Dorothy Neal White Collection, Margaret Mahy, died 23 July 2012. Obituary. Copies of the full minutes of the 2012 AGM will be posted soon. Following the 2012 AGM the award-winning local author Fleur Beale (right) addressed the meeting. We would welcome more committee members! Copies of the full minutes of the 2014 AGM will be available on this website http://www.dnwfriends.nzl.org/ soon. Friends of the Dorothy Neal White Collection End of Year Event. The Friends of Dorothy Neal White Collection have great pleasure in inviting you to our end of year event. Join the committee for festive drinks and nibbles and the opportunity to have a guided tour of the new exhibition in the Turnbull gallery ‘A Child’s war’ with exhibition curator, Mary Skarott. Location: Tiakiwai (lower ground floor), Aitken Street entrance, National Library building. Contact Details: Email Mary Skarott or phone 04 470 4488. We note with sadness the death of Friend of DNW, Carrick Lewis. Carrick was active in many community groups across many decades. His interests included Grey Power and the United Nations, as well as several arts and education groups. Carrick was valued for his supportive attitude to his fellow workers. He is sadly missed in Wellington circles.There was a memorial service for Carrick on Thursday 6 November, 2014 at LYCHGATE, Willis Street at 3.00 o’clock. A private cremation took place earlier in the week. Jill is Senior Research Associate in Arts at Trinity College, University of Toronto talk about the history of children’s literature and book illustration in the 18th century. Space is limited, so book your spot by emailing Mary.Skarott@dia.govt.nz. Top: Friends of the Dorothy Neal White Collection research scholarship recipient, Anne Siebeck, addressing the Friends meeting on Wednesday 8 February 2012. Lower: Friends after Anne’s presentation discussing her research.